A few years ago, a 29-year-old co-worker of mine said her birthday was July 7. Being the ultimate fan/geek that I am, I told her she had the same birthday as Ringo Starr. For people of my generation, that would be like asking if Snookie is on TV or if George Washington ever served as leader of a country. It always delights me when I see college-aged kids wearing Pink Floyd or Black Sabbath tee-shirts. In some ways, that would be like me wearing a tee-shirt with a picture of Doris Day – a star popular in my mother's time. Every generation selects its own heroes, musical or otherwise. No one is obligated to honor the pop culture gods of the past, and that’s how it should be. Yet part of me hopes the Beatles will always live on in the hearts and minds of others, because they were so significant to so many people for so long. Besides, if you're a fan of today's music, you may discover there's a wealth of information about people who were popular before Lady Gaga, and this information can benefit you in ways you'd never imagine. For example, the Beatles can teach us a lot about writing. This is no small feat since they were musicians, not fiction writers (though John Lennon did write two books); yet the qualities which made them one of the most influential bands in the world can be adopted by writers. 1. Always grow. The Beatles started out singing simple love songs such as “Love Me Do” and “Please Please Me,” but they soon expanded their songwriting and wrote more complex music. “Strawberry Fields Forever” (1967) is less than five years removed from “Love Me Do” (1962), but it is miles apart in terms of compositon and experimentation. “Come Together” (1969) shows the Beatles playing with words, while “Something” (1969) is a hauntingly beautiful ballad. As creative people, the Beatles never sat still. Neither should you. 2. Study new instruments. When the Beatles started in the late ‘50s, John Lennon, Paul McCartney, and George Harrison all played guitar. A short time later, Paul switched to bass, and Ringo joined on drums in 1962. Many musicians become known for playing one or maybe two instruments. Not the Beatles. After their commerical breakthrough, Paul took piano lessons and studied classical music. George introduced the sitar, a middle eastern instrument, into the group. All of the Beatles sang and took turns singing lead on different songs. As writers, we can always learn new tools of the trade, such as new technology, new avenues for publishing, and new skills that our characters may use. 3. Find an expert/mentor to help you. The Beatles benefited from their apprenticeship to George Martin, who had spent years as a staff producer at EMI and head of its Parlophone label before taking on these four scruffy lads from Liverpool. If it wasn’t a match made in heaven, it should have been. In the beginning, Martin called the shots in the studio, but, as the Beatles matured as songwriters and musicians, they exerted more control. Nevertheless, they relied on Martin to produce all but one of their albums for a simple reason: he knew what he was doing. Martin could take the Beatles’ vague musical ideas and translate them into workable results. For example, he and engineer Geoff Emerick painstakingly edited two versions of "Strawberry Fields Forever" into a masterpiece – even though they were in different tempos and keys! George Martin was in every sense a musical collaborator who guided the Beatles and knew when it was time to let them complete their journey on their own. 4. Stay true to your core values, beliefs, philosophy, or message. Although the Beatles grew as musicians and songwriters, their core message remained remarkably consistent. 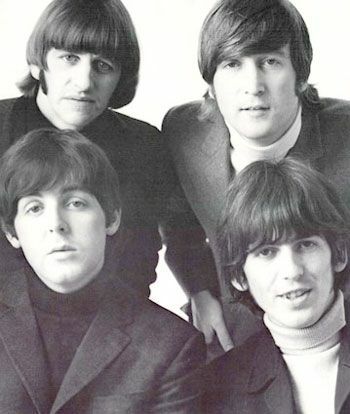 As late as 1967, they were singing “All You Need is Love,” and they carried their optimistic and simple visions of love into their solo careers: “Imagine” (John), “Silly Love Songs” (Paul), “Give Me Love (Give Me Peace on Earth)” (George). Significantly, the Beatles did not record songs like "(I Can't Get No) Satisfaction" or "I Can See for Miles" – great hits for the Rolling Stones and the Who, respectively, but which would have been startlingly out of place with the Beatles' vision of the world. Your core values, beliefs or philosophy will come through your writing. It may take several pieces for you (or your readers) to understand what your message is, but once it becomes clear, your readers will look forward to it in your work. 5. Know when to let go. The Beatles broke the hearts of millions of fans when they broke up in 1970, but, for the four men involved, going their separate ways was probably for the best. They had grown as individual artists, as their solo successes attest. It was time for each Beatle to leave home and continue to grow on his own. Likewise, as writers we need to know when it’s time to let a story go. We’ ve worked on it, slaved over it, revised it countless times. It will never be perfect, but it doesn’t have be perfect, just great. There comes a time when every writer has to let it be. Norman, Philip. Shout! The Beatles in Their Generation. New York: MJF, 1981. That's good stuff. Just plain and simply good. I think that there is a lot to be gained from listening to musicians of the past, it tends to help you understand what people are singing about now. The same is true with literature. I'm not a big fan of a lot of books that I was required to read in School, Lord of the Flies being at the top of my very least favorite, and Fahrenheit 451 at the top of my favorites list. But having read those and the others that fell in between, I understand the established conventions, even if some are unsavory. I am currently struggling with the "Letting Go" part, Even though I know in my head that what I have written is good and that I'm happy with it, I still have difficulty releasing it, letting it out of my protective grasp. I guess I'm somewhat afraid of what people will think of it or what they will do to it. If there is one thing we can learn from the Beatles, it's their ability to be themselves and to do what they wanted to do, despite what others thought of them. It was a pretty big shock to the music world when they announced that they would no longer do live shows, specifically touring. They made a bold step and used the recording studio as their main means of expression. As a result of that, the recording business saw innovations and invention, in other words-progress. This also opened the door to the modern age in music production where the average person has access, for quite the fee, to software that can turn almost any computer into a mini studio capable of producing quality music. A good example of this is Owl City. He started out as just a poor insomniac in his parent's basement. He passed the hours of sleeplessness by making fun little electronic songs. He put his nocturnal creations up on MySpace and was noticed. Now he gets paid to do what he loves. He doesn't posses any outstanding ability in any particular instrument but he understands how music works. I am of the opinion that if he started doing this sort of thing twenty years ago, he wouldn't have the success he enjoys now. Not to fault him, but it's a sign of the times. He was able to benefit from something the Beatles started in 1962. "I am currently struggling with the "Letting Go" part . . . If there is one thing we can learn from the Beatles, it's their ability to be themselves and to do what they wanted to do, despite what others thought of them." Good point. Somehow, the Beatles were able to be themselves and become very successful at it. They did this, I think, by understanding the conventions of the medium and genre they were working in (pop music) and knowing it well enough to move beyond the real or imagined confines. As experimental as "Strawberry Fields Forever" is, it's still a damn fine pop tune: catchy, pleasing, easy to sing along with. And yes, that letting go part is tough.